Chameleon Touring Systems have been on board as a partner of the Event Awards and Symposium for many years. We had a chat with their director Tony Davies about their thriving lighting business and support of the Awards. What makes Chameleon stand out in the industry? What do you pride yourselves on? Chameleon is a Specialist Lighting Company with a very large inventory of the latest lighting products. They are Australia’s most experienced and respected professional lighting supplier with a highly experienced team of Account Managers, Crew Chiefs, Technicians and Warehouse staff to assist you in realising your objective. What values does your brand align with and how do you put that into action in the industry? Chameleon is proudly Australian owned and combining high standards of excellence with a friendly approach, our team is committed to delivering the best results every time. We spend next to nothing on advertising/sales team so all of our work comes from word of mouth and repeat business. Can you share some of your reasons for supporting the Australian Event Awards and Symposium? We are supporting it because it is a great concept and is very good for the industry. I also get to go to the Sunshine Coast for a holiday which is really cool! What’s new or upcoming for your company? Can you share any exciting plans with us? We just moved into the 90’s and are trying to embrace social media so we have a new website and Facebook page. We have a lot of new weatherproof products/stock, making them ideal for outdoor events. What has been your favourite event in the past year – either to work on or attend? 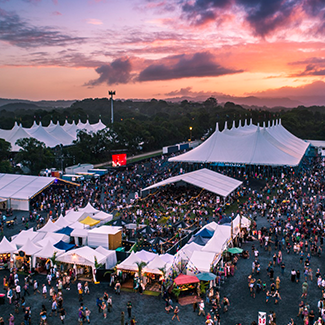 This year’s State of Origin 1 at the Melbourne Cricket Ground and also Bluesfest at Byron Bay. What is the best advice you’ve ever been given in this industry? Eric Robinson, the late managing director of JPJ Audio, said to me after losing a major TV show “it’s a branch not a tree – get over it, move on.” I only lost that contract for 1 year but gained it back the very next year and have kept it ever since. What’s your favourite thing about the events industry, and what do you see as its greatest challenge? This is the 10th year of the Australian Event Awards – can you share your favourite Event Awards memory with us? David Grant receiving the Lifetime Achievement Award. Click here to visit Chameleon’s brand new website.